Clarets boss Sean Dyche would be in favour of the proposal to bring the summer transfer deadline forward to shut before the start of the next Premier League season. But he admits, he sees no end in sight to the skyrocketing fees being asked for players in the current market. Dyche saw Andre Gray leave in an £18m move to Watford three days before the start of the season, and it is a frustration to managers to be bringing your pre-season work to a close, only for it to be impacted by the window. Asked whether he would prefer to window to close sooner, he said: “Yeah, Andre Gray moved just before the start of the season. In theory, he could take all the work we’ve done in pre-season and let them know it. “So why would you do that? Now they couldn’t do this, but ideally, you’d actually have the deadline 10 days before the first game, because usually those 10 days are when you’re fine tuning all of your details. Certainly that’s how we work. “The early part of pre-season is about general fitness, general welfare of the players, rough guidelines on the shape, rough guidelines on the team, etc, etc. “Those last 10 days, you really start crunching down on the details of set-pieces, of game plans, of getting the team looking roughly what it is. And he doesn't see any reason why a shorter window would make the market even more problematic: “No, not necessarily, because I think the work would just be done earlier. “Chris (Boden) brought up a fair one actually, with the World Cup year. “That’s probably the only year where they would have to look at a different way of doing it, not only because of the number of days between seasons, but also the fact that World Cups pop up some players who you’ve not really worried about, or thought about, and then suddenly they’re world stars overnight. “So then you get that period where you think: ‘Well, who’s signing them?’ Because they often do move. We’ve all seen it. “A player makes their name at a World Cup and moves very quickly afterwards. Well, that would be super-accelerated. 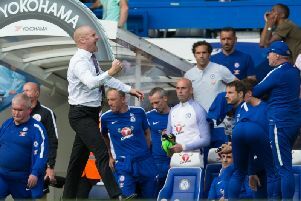 There are some European leagues which already have different deadlines, some by hours, some by weeks, and Dyche added: “They would have to align somehow, roughly, but I think there are a couple that are non-aligned now. “I think Germany and someone else are not aligned. So it can be done. “It’s just a question of who they consider or what markets they think should be all in line for their given day, when it cuts off. “I’m not sure it will even go back to an open market. Strangely, I think there’s a lot of talk in general life about restriction of trade and stuff like that. “How come people are allowed to move jobs, and yet in football, apparently, you’re not? So who knows? Dyche admits it is hard to gauge what players are worth as well in this day and age when sizing up bids. Asked whether he would expect to break the transfer record again, he said: “I don’t know. We broke it with Andre every other month, didn’t we? The first year he signed. “No, I don’t know. We’ll have to wait and see. The market, as I’ve said many times, there are no rules to it now. It used to be the case that we could all sit in a room and if I put 10 players on the board, we could all more or less get it [their transfer values] right. “Now, we wouldn’t have a clue. We’d all be going: ‘I don’t what he’s going to move for.’ It’s just fathoming it out the best you can and putting up the money available that you think is appropriate for what your situation is. Yet in Italy, Juventus have just signed Blaise Matuidi from Paris St Germain, and Javier Hernandez joined West Ham from Bayer Leverkusen for £13m, so is it just this country that the price tags have gone mad? : “Is it just because of the power of the Premier League and the finances? I know Germany still gets financed well from TV, and so does La Liga, but not to the extent of the Premier League, and then that drifts down. “The generalised view is that even in the Championship, there’s an argument that in Europe it’s the fourth or fifth best league, most competitive league, richest league, whichever way you want to put it. If you add that in, then there’s going to be more competition, lots of backing. “There are lots of owners in the Championship who are beyond our wealth at Burnley, and our owner’s wealth, way beyond it.So they’re all going for the big prize. There seems no sign that the bubble will burst any time soon either: “Well, there doesn’t seem to be an end in sight. There has been scaremongering that football is going to burst for 15 years. “When you go to the meetings they say there’s still untapped sources, where there’s still revenue streams to be had. I don’t know what will stop it, eventually it will slow down, but I don’t know what will bring a stop to it. “I got told the other day that French TV are no asking for Christmas football. At Christmas in Europe everyone watches English football because we play. For the last 20 years we’ve been laughed off for playing at Christmas. “And no people want to watch their own teams over the Christmas period. That could be a twist.